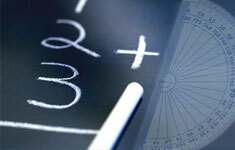 Objective Learn how to write fractions as decimals, using long division. This lesson is an excellent application of long division and division of decimals. It is important to be able to write fractions as decimals. It is more difficult to compare and perform addition and subtraction on fractions than on decimals. Remember that fractions really represent the division of one integer by another integer. For example, represents the division of 5 by 7. The division represented by a fraction can be performed to produce the decimal equivalent of the fraction. To write a fraction in decimal form, divide the numerator by the denominator. a. First write 3 as 3.0, and then divide by 5.
b. Write 1 as 1.0 and then divide by 2. Sometimes it is necessary to add more than one zero at the end of the decimal created from the numerator. One additional zero is added and the division continues each time a division step results in a remainder. This is shown in the following examples. Since the division in this step resulted in a remainder of 10, we add another zero to the dividend, 7.0, and continue dividing. The division has no remainder, so . b. Begin by rewriting as the division 3.0 Ã· 25. Since there is a remainder, add another zero and continue dividing. The two previous examples show a pattern in which for single-digit denominators only one zero is needed for the division, and for double-digit denominators two zeros are needed. The following example shows that the pattern was only coincidental. Write as the division 5.0 Ã· 8. Add another zero to the dividend and continue dividing. Add another zero and continue dividing. Sometimes the division never comes out evenly no matter how many zeros we add. Use long division as in Examples 13. (the dots mean that the pattern continues indefinitely), which can also be written as (the bar over the 3 means that the digit repeats). When the division never comes out evenly, the fraction cannot be written as a terminating decimal (a decimal that ends). However, in these situations there is always a pattern of digits that eventually repeats, and it may involve more than just a single digit, as in Example 4.
are called repeating (or nonterminating ) decimals because one or more digits repeat.